my little red suitcase: A very merry christmas from the common! A very merry christmas from the common! 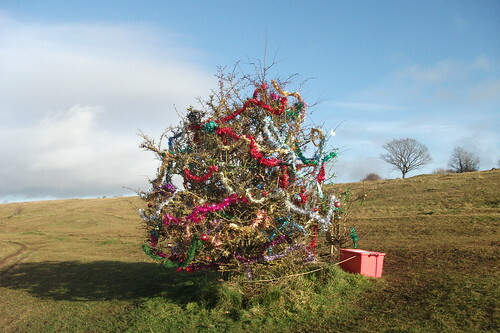 At last in all it's glory I present the dog walkers christmas tree! 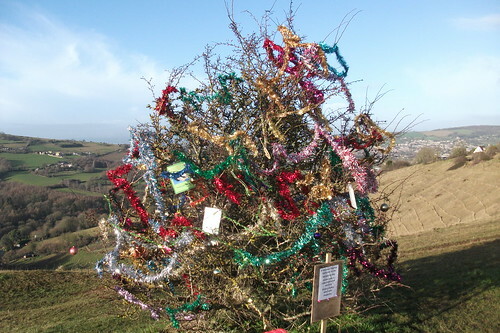 it looks at it's best in the sun as you can see the tinsel sparkling and billowing in the breeze. It has become something of a pilgrimage to come and see this tree at christmas. There are lots of cards and pictures, some from furry friends departed, and lots of change and dog food in the box below. I do hope for some sunny skies this christmas, at the moment we seem to have descended under a blanket of fog and rain! I hope it will pass. 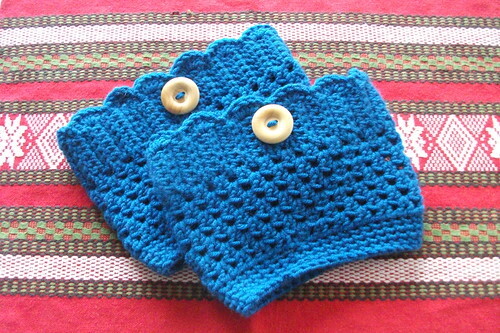 These boot cuffs were actually quite easy and quick to make, you can find a tutorial here. I imagine they could be fun in all different colours! Also I was very excited to have a couple of last minute sales in my etsy shop this week. You may have notice a couple of cushions have disappeared. One on it's way to the Netherlands and one in the UK. I am encouraged by this and plan on concentrating next year on filling it up more. It's hard to tell if you are pricing things right or which styles to aim for, but there are a lot of projects to finish off and list. So I wish you a warm and magical christmas eve as we prepare for santa! and wish you a very merry christmas! That is so wonderful to see at last! And that tree is incredible, I think it's a wonderful tradition. The dog tree is amazing!!!! Love your boot cuffs and I'm happy how things are going on in your shop!!! And I loved boot cuffs so much, I want to try it, or I can want them from my little sister:)She is more talented than me on knitting work. Lovely to see the tree all decorated! What a great tree, Merry Christmas. I love those boot cuffs, great colour, but the tree steals the show! Dear Heather, have a very good Christmas. Enjoy with your love one's. I think this is the best tree I have ever seen! Like EVER! I'm so glad you posted a photo of that tree! I have loved hearing about it and seeing it! And it turned out Gorgeous! Yay! I hope you and yours have had a wonderful Christmas Heather. Love, love, love the tree ... what a fabulous tradition! Hi there Heather, I just read your comment that your son likes BB Guns too, well I tell you I freaked out a little when he wanted one, I thought for sure he WOULD shoot his eye out! For now he can't use it unless he's supervised. That kind of puts my mind to rest... for now! He's only 10 though! Delighted that you etsy shop is doing business. I ended up moving my etsy wares to an auction site and sold a dozen shopping bags in an evening. 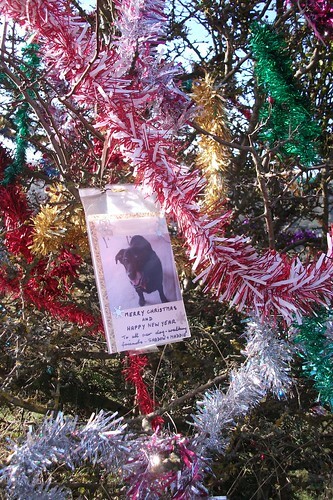 The dog walkers tree is a delightful project. The anonymity of it appeals to me. Hit-and-run decorating. The finished dog walker's tree looks great! I hope you had a lovely Christmas and wish you all the very best for 2013.